Brickcom Corporation and its Affiliates warrant to Brickcom's Product that it will be in good working order for a period of up to three years * from the date of purchase from Brickcom or an authorized Brickcom reseller. 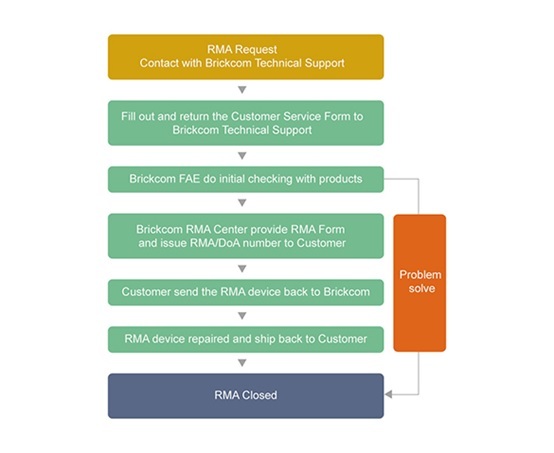 During the term of the warranty, should this Product, in Brickcom's opinion, malfunction, Brickcom will, at its option, repair or replace it free of charge, excluding shipment cost for the user to a Brickcom point of sales. This warranty is void in case the Product has been subject to misuse, abuse, misapplication, use outside the intended application or in case the Product has been modified, altered and/or repaired in a way not authorized by Brickcom. All parts and Products that are replaced shall become the property of Brickcom.Brickcom has the right to replace faulty products with used ("refurbished") products, at its own discretion. THE FOREGOING CONSTITUTES THE SOLE AND EXCLUSIVE WARRANTY OF BRICKCOM. BRICKCOM EXPRESSLY DISCLAIMS ALL WARRANTIES WITH RESPECT TO THE PRODUCT, INCLUDING WITHOUT LIMITATION ALL WARRANTIES, EXPRESS OR IMPLIED, WITH RESPECT TO THE MERCHANTABILITY, FITNESS FOR A PARTICULAR PURPOSE, USE, RELIABILITY, PERFORMANCE, CORRECTNESS, CURRENTNESS OR OTHERWISE OF THE PRODUCTS AND ACCOMPANYING PRINTED MATERIALS, AND PROVIDES THESE PROGRAMS AND MATERIALS "AS IS". IN NO EVENT SHALL BRICKCOM, ITS DIRECTORS, OFFICERS, EMPLOYEES, SHAREHOLDERS OR REPRESENTATIVES BE LIABLE FOR ANY DAMAGES WHATSOEVER, INCLUDING INCIDENTAL OR CONSEQUENTIAL DAMAGES (INCLUDING, WITHOUT LIMITATION, SPECIAL, INDIRECT, INCIDENTAL OR CONSEQUENTIAL DAMAGES, DAMAGES FOR DELAY, LOSS OF BUSINESS INFORMATION, LOSS OF PROFITS OR GOODWILL, LOST SAVINGS, OR OTHER PECUNIARY LOSS) INCURRED BY THE USER OR THE USER'S INABILITY TO USE THIS PRODUCT, EVEN IF BRICKCOM HAS BEEN NOTIFIED OF THE POSSIBILITY OR LIKELIHOOD OF SUCH DAMAGES OCCURRING.